The Bissell PowerLifter PowerBrush Upright Deep Cleaner 1622 is a lightweight but powerful carpet cleaner that features 4-rows of Bissell’s proven DirtLifter PowerBrushes system. The PowerLifter PowerBrush 1622 is ideal for users seeking a smaller and lighter carpet cleaner for smaller homes or for convenient everyday spot cleaning. This model has been around for a number of years, and has a great track record and lots of positive customer feedback. This machine stands out for its cleaning performance and high motor power despite costing only around $100 (price check). While it has an older look and feel and weighs more than lightweight cleaners like the Bissell Powerbrush 47B2 or Bissell Powerbrush 40N7, it delivers a higher level of cleaning effectiveness. The 4 rows of deep-cleaning PowerBrushes ensure that your carpet is cleaned in a very thorough and complete way. The stiff brush bristles are configured in wavy manner. When rotated, they are designed to root out dirt hidden even in the deepest carpet pile. This cleaner is uses the same DirtLifter brushing technology that Bissell’s more advanced (and costly) cleaners use. The end result is a carpet which doesn’t just look clean, but is truly clean down to its very core. Users can fill the clean water “bladder” tank with hot tap water. Like almost all carpet steam cleaners including the Rug Doctor, this cleaner does not feature a hot water heater. You do obviously need to make sure that the rug, carpet or upholstery you’re cleaning is compatible with being cleaned with hot water, but outside of that precaution you’ll find that being able to clean your carpet with warm water makes a huge difference to the final results you achieve. The 11-inch cleaning path of the PowerBrush Deep Carpet Cleaner 1622 is just as wide as you would expect for a more expensive regular sized cleaner. 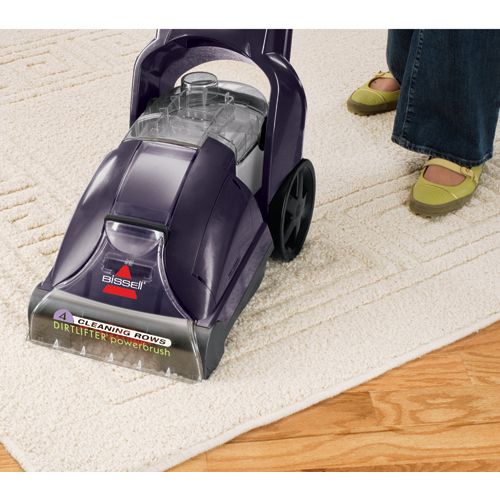 It just means you can clean more carpet in less time, and this means getting your carpet dried out more quickly too. This carpet shampooer features a 2-in-1 water tank. Users fill the inside “bladder” of the tank to supply it with the clean water it needs for cleaning. When this cleaner is sucking dirty water back up from the rug or carpet, it gets stored in the water tank around the internal water bladder. Although not everyone loves this system, it does work very well, and makes for a more compact carpet cleaner. 6.25 amps. 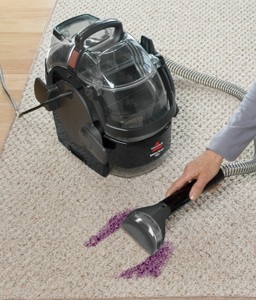 This compares well to Bissell’s range of regular full-sized upright home carpet cleaners. For example, both Bissell’s Proheat 8852 Deep Cleaner and Bissell DeepClean Premier Pet Carpet Cleaner 17N4 are in the same power amperage class as the Bissell 1622. This handy feature ensures that the cleaning nozzles, and the internal water bladder, don’t get clogged up with the annoying lumps of lint which are part of cleaning any carpet. Nobody really knows where lint comes from, but the PowerBrush Upright Deep Cleaner 1622 deals with it very effectively regardless. The Bissell PowerLifter PowerBrush Upright Deep Cleaner 1622 comes with a built-in measuring cup, so you’ll never have to guess how much cleaning solution you’ve just used. There is a complimentary 16-oz starter bottle of cleaning solution included with each new Bissell PowerLifter carpet cleaner. A 20-foot power cord allows anyone using this carpet cleaner to effectively clean most large rooms without having to swap over to a new power outlet. You’ll be able to clean most average, or larger, homes with a cord of this length. The PowerLifter Deep Cleaner 1622 comes with a 1 year limited warranty. Bissell does stand behind their products and offer good support when customers call with questions. 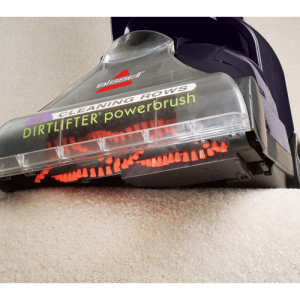 The DirtLifter brushes fitted to the Bissell PowerLifter PowerBrush 1622 give users the cleaning muscle to tackle even the nastiest and oldest of carpet or rug stains. The brushing technology is the same as those found in more advanced Bissell carpet cleaners. DirtLifter power-brushing will not only scrub the carpet pile clean of stains and dirt particles. They dig down into the pile deeply, so that the carpet will be groomed as a result. With 4 rows of DirtLifter brushes, compared to as much as 10 to 12 rows for some of Bissell’s bigger cleaners like the Bissell Proheat 2X Premier Carpet Cleaner 47A23, it is not built for heavy duty cleaning. However, even with 4 rows of brushes, it does a tremendous job. Amongst lightweight carpet cleaning machines, this Bissell model has the best user feedback regarding it’s ability to clean. It has double the power amperage of the Bissell ReadyClean PowerBrush 47B2, as well as greater brushing action. An overwhelming majority of users, including many pet owners, are highly satisfied with the machine’s cleaning abilities. Some even venture to say that this cleaner worked better for them than more expensive models they’ve used previously. A number of users with Berber carpets reported receiving great cleaning results from this cleaner. Bissell does warn that the brushing can fuzz Berber carpets and ask that users pretest the unit before proceeding. Cleaning your carpets regularly also extends their lifespan, so users are actually saving money by investing in a good carpet cleaner. One of the things we love most about the PowerLifter PowerBrush 1622 is that it’s so easy to use and lightweight. Most regular full-sized upright carpet cleaner weigh 20 pounds or more before water is added. As a comparison, Bissell’s popular Proheat 8852 Essential deep cleaner weighs 24 pounds, compared to 16.4 pounds for the Bissell PowerLifter PowerBrush 1622. The additional features like a built-in measuring cup, the lint screen, comfortable handle and removable nozzle, all back up the fact that Bissell designed this carpet cleaner to be easy-to-use, as well as being an incredibly cost-effective carpet cleaning solution. For a relatively lightweight but full-powered carpet cleaning machine, compare this to the Hoover Power Scrub Deluxe Carpet Washer FH50150 that weighs 19 lbs. Obviously, the fact that it can use hot water as part of the cleaning process means you get better results, and we’ve often found ourselves surprised at just how much cleaner a carpet can be after being cleaned with warm water. Unlike the Bissell Essential 8852 Deep Cleaner, the Bissell PowerLifter PowerBrush Deep Cleaner 1622 doesn’t have Bissell’s HeatWave technology, which helps to keep water warm. Keep in mind that the tank capacity for this machine is small (3/4 gallon). If you were to add hot warm water, there isn’t much time for the water to cool off while cleaning a carpet area. You do need to be careful that you don’t fill this carpet cleaner with boiling water (just like with other domestic carpet cleaners) – it can be dangerous for you and to the carpet shampooer too. The Bissell PowerLifter PowerBrush 1622 has been widely sold and used for over 5 years. It has attracted lots of 5 out of 5 star ratings from happy users because it works! This is not a new design that is still being market tested and refined. It appears to have fewer complaints regarding machine malfunctions than the average regular-grade carpet cleaner model. In comparison, not too long ago, Hoover introduced a cutting edge light-weight cleaner – the Hoover Power Path Deluxe Carpet Washer FH50951. Although it is sleek looking and comes with lots of great features, it just isn’t getting a good level of user acceptance. Some users are unhappy with its cleaning performance, while others experienced operations problems. Compared to the Hoover Power Path FH50951, the Bissell PowerLifter PowerBrush 1622 seems more reliable and certainly has a longer track record of success. The Bissell PowerLifter PowerBrush 1622 costs around $100, compared to $150 and higher for the least expensive of regular upright home carpet cleaners. There is no catch here. The lower price reflects the fact that the PowerLifter 1622 features lesser rows of brushes (4 instead of 6 to 12 with regular-grade cleaners). Features like connecting to upholstery tools, or Heatwave technology to keep the water warm are also missing. This is a bare bones cleaner that is meant to clean carpets well and weigh less than regular upright consumer cleaner models. It is a great machine for users who do not have much use for the extras features that not only add to the cost, but weigh down the machine. Sometimes, less is more because the lightweight makes users want to use it more frequently, and so they get to enjoy cleaner carpets. Compared to other similarly priced lightweight cleaners like the Bissell ReadyClean PowerBrush Carpet Cleaner 47B2, it may have an older design and weigh more, but it is has greater motor power and cleans better. For users looking for the highest level of cleaning performance from a hundred-dollar upright deep cleaner machine, this is the best one. The Bissell PowerLifter PowerBrush Upright Deep Cleaner 1622 does not come with an upholstery hose or connection to it, and cannot be fitted with attachments to clean upholstery or car seats and carpets. It’s a dedicated floor carpet cleaner. For a more versatile machine, consider the Bissell 8852 Essential Deep Cleaner or Bissell Powersteamer 1623. As useful as warm/hot water can be when removing those old stains from carpets you do need to be careful when using hot water to clean either human or animal urine stains. For some odd reason hot water can cause the odor from these stains to get worse, so you may to experiment with using cool or lukewarm water instead. There are also specialized Bissell cleaning detergents for this type of stain and odor – you just need to select which one best suits you needs. As with any high-quality carpet cleaner it’s wise to only use Bissell brand cleaning detergent when operating the cleaner itself. We’ve seen all the generic cleaner solutions claim that they can be used in any carpet cleaner, but we’re not sure that’s worth the risk of invalidating your warranty. Customers often purchase the following Bissell cleaning solutions alongside this machine: Bissell 2X Professional Deep Cleaning Formula and Bissell 2X Pet Stain & Odor Full Size Machine Formula. Should You Buy The Bissell PowerLifter PowerBrush Upright Deep Cleaner 1622? The Bissell PowerLifter PowerBrush 1622 Deep Cleaner is a lightweight and easy-to-use carpet cleaner that delivers high quality cleaning results. It is the ideal machine for smaller homes or for use as a lightweight spot cleaner for cleaning up everyday spills and stains. Overall, this carpet cleaner offers incredible value that is hard to beat. Not sure about this? Visit the Lightweight Carpet Cleaners Reviews reviews section to find a list of the best small and lightweight carpet cleaners. To learn more about other types and models of carpet cleaners, visit our homepage and check out the listings on there.